TECHNI provides waterjet cutting solutions to shops specializing in cutting, racing, and fabricating. TECHNI is one of the world’s leading manufacturers of profile waterjet cutting systems. 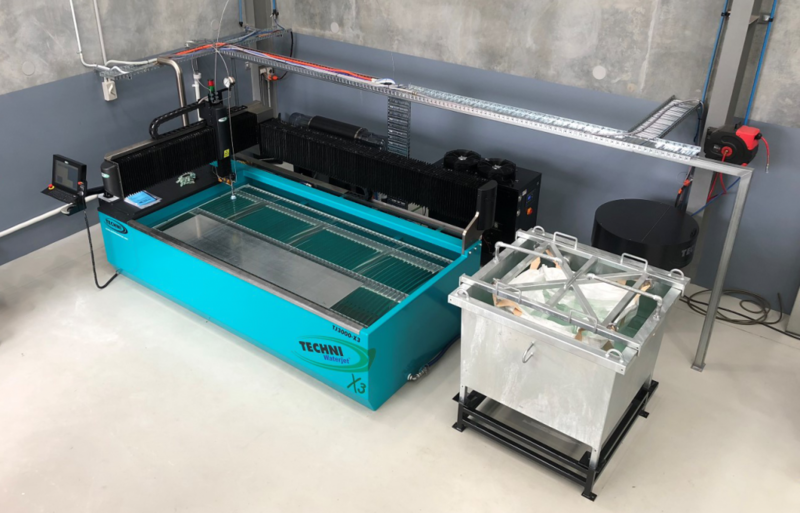 TECHNI Waterjet offers complete water jet cutter solutions utilizing their own patented in-house technologies for everything from their revolutionary Electric Servo Waterjet Pump to their 5-axis cutting head. TECHNI has been operating for almost 30 years and has an installation base of more than 1000 waterjet machines or water cut systems spread across six continents and in some 26 countries. When Aaron Chambers opened up a cutting business back in 2008, he knew he wanted his shop to be more diverse than other shops. That’s why he researched different waterjet manufacturers and came to rest on TECHNI Waterjet™. Soon after he opened his business and the business began to grow, Chambers knew he needed more support. That’s when his brother Warrick Chambers came on board to assist with sales and project management. Since then, their business has taken off and they are finding different ways to increase their business and still keep costs down. That is the main reason they looked into adding solar panels on their building. Not only are the savvy business owners lowering their electricity bill with solar panels, but they also installed TECHNI’s Quantum NXT™ (Electric Servo Pump) 66Dual, which is up to 60% more efficient than standard hydraulic intensifier pumps. 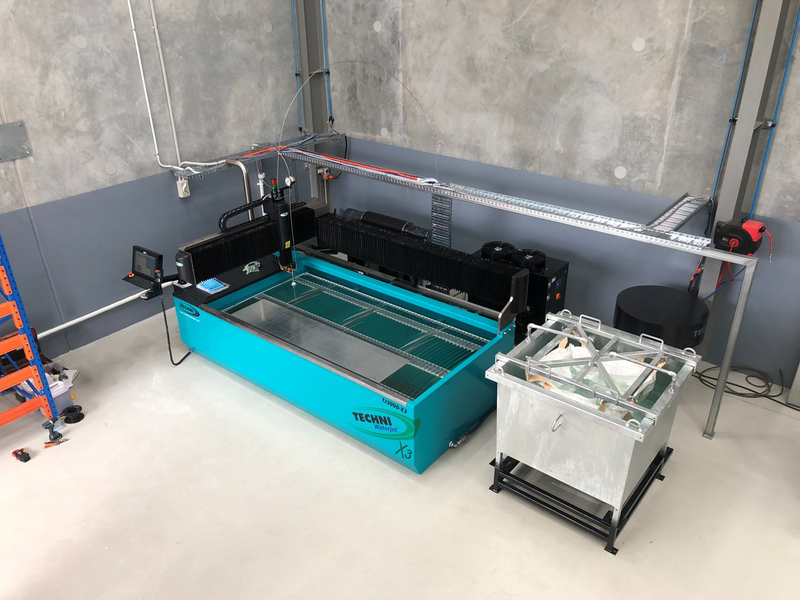 Aztech Cutting Solutions was used to operating with standard hydraulic intensifier on their first Waterjet machine, but when they swapped out the old technology with the new innovative technology of a Quantum NXT™ (ESP) their savings continued to increase. 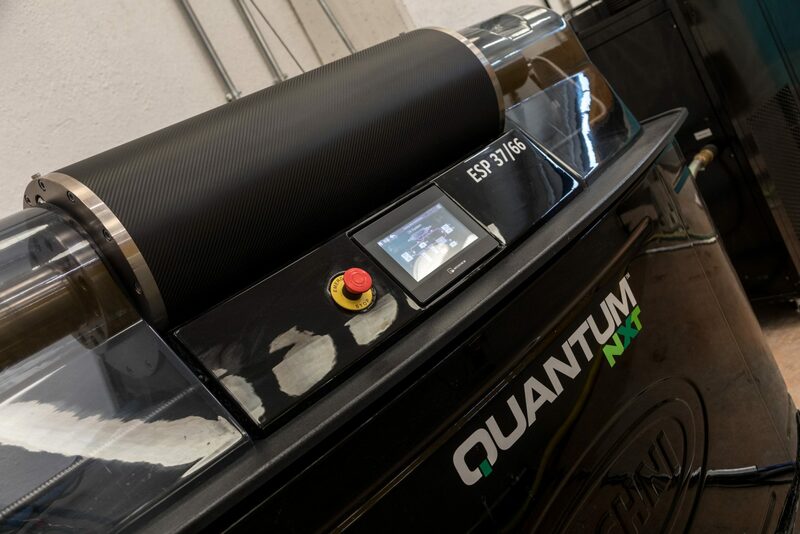 “With the use of the solar panels coupled with the energy savings from the Quantum NXT™ (ESP), we estimate that we’ll be saving anywhere from $12K – $16k per year on electricity,” explains Chambers. Endless cutting possibilities and dedication to excellence are what set Aztech Cutting Solutions apart from others in the cutting industry. 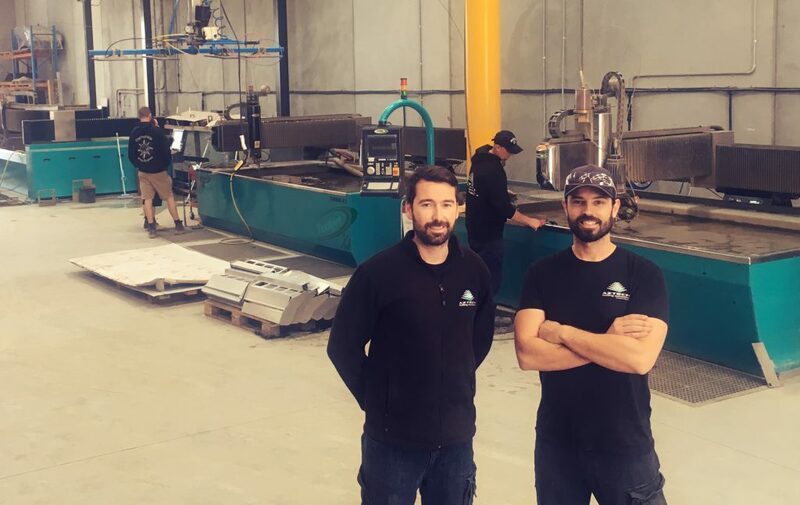 Aztech Cutting Solutions cuts most everything from 50mm Bissalloy steel on one waterjet to 2mm Aluminum on the second waterjet to 20mm Marble on their third twin head waterjet. They have also added the PAC 60™ Five Axis Cutting Head to their waterjet for bevel cutting and taper compensation. At this very moment, they are installing another Techni WATERJET 6m machine with twin heads, which makes it four machines and seven cutting heads in total. Endless cutting possibilities and dedication to excellence are what set this business apart from others in the cutting industry, making the team at Aztech Cutting Solutions true industry leaders. Robby Gordon has had success on the race track at NASCAR, IndyCar, TransAm, Dakar Rally, and now the Stadium Super Trucks series has grown wildly successful. Stadium Super Trucks is also an international success with series in Australia, England, Canada, and throughout the United States. Gordon has been designing and developing in the racing industry for 30 years and knows how to build a state-of-the-art vehicle. In order to build these types of machines, Gordon and his team need many different types of high-tech equipment. You can’t put a price on the turnaround and time saved by having a waterjet in-house,” stated Robby Gordon. 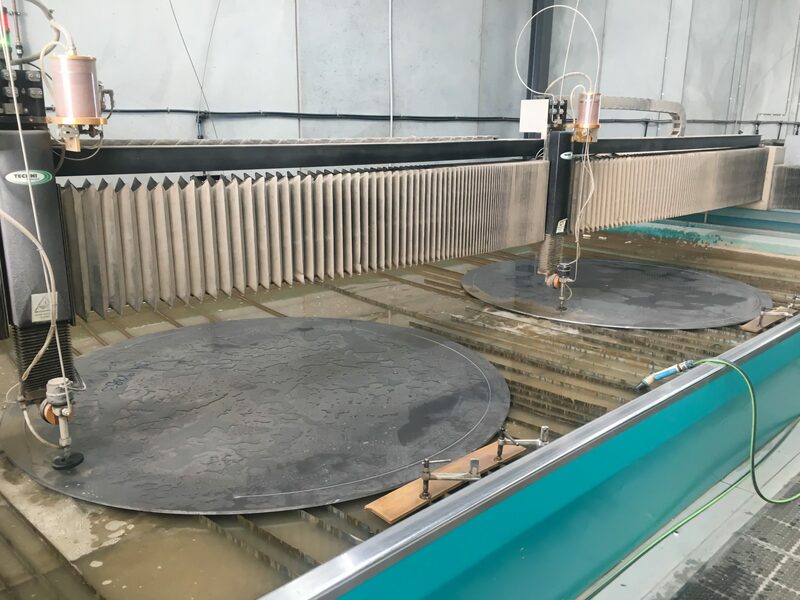 Housed within the RGM facility in Charlotte, North Carolina is a TECHNI Waterjet ILS 55 (5’x5’) Waterjet Cutting System capable of cutting up to 6” thick material. Mainly .040-1” aluminum, .063-.5” chromoly, plastics and other materials that are non-metallic are cut on the waterjet. With an industry leading commitment to quality, service, and problem solving, JK Prototype prides itself in the ability to get the job done and they have chosen yet again to provide this quality with another Techni™ system. Whether that job to be done is building custom tooling which must meet precision tolerances or stamping out tens of thousands of short-run production parts, JK is an industry leading job shop trusting Techni Waterjet™ to take them to the next level of superiority. 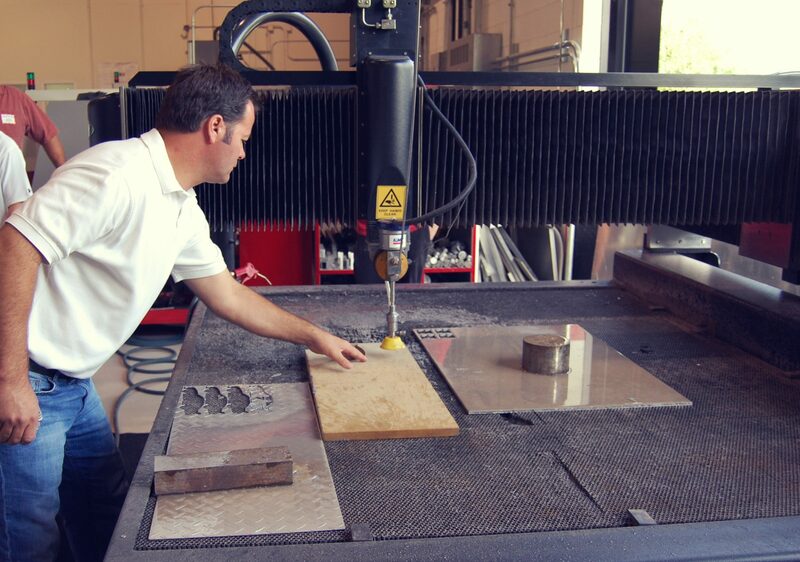 One of the biggest advantages of waterjet cutting is the waterjet’s inherent cold cutting quality. Techni Waterjet™ prides itself in providing their customers with continued reliability and quality of product yet, above all, Techni realizes that relationship with their customers is key for long-term success. From the master service team to executive support, Techni™ goes the distance for their valued customers. Speaking towards the executive support offered, Mr. Stedtefeld stated, “Having the ability to reach Senior Staff anytime for anything was also appreciated”. JK Prototype handles a variety of materials such as cold rolled steel, stainless steel, spring steel and nickel-based alloys, copper and copper alloys, aluminum and phenolics. Their new Techni Techjet-X3® coupled with their GEN4 Quantum NXT™ pump will continue to support them in delivering pristine stamped and drawn parts from these materials that comply with customer specifications.